The Director of First impressions is the replaced title of Receptionist. As the receptionists are the first person of contact between the company and the clients, investors, etc, the impression of this first-person reflects upon the whole company as such. 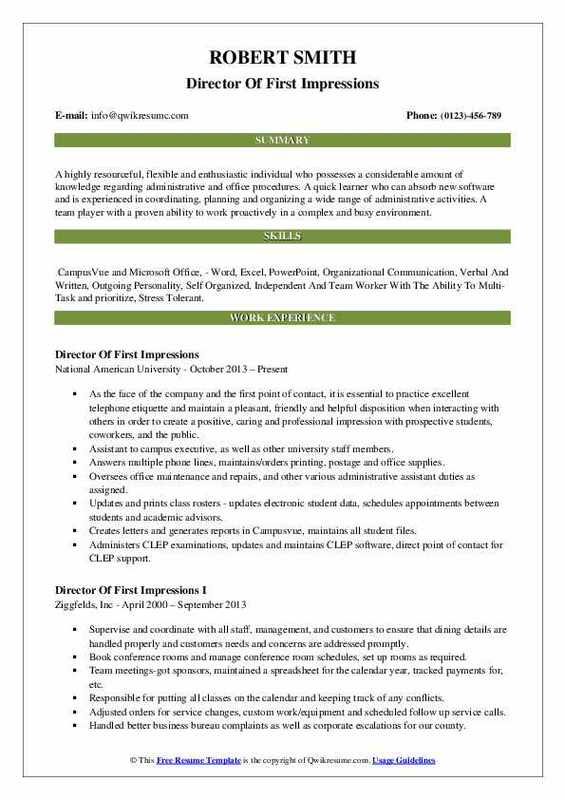 The most crucial tasks taken up by the director of first impressions include – greeting potential clients, handling all incoming calls, sorting and distributing mail, sending periodical correspondence, coordinating client paperwork, handling calendars, ordering and handling office supplies, maintaining a record of all activities and disbursing all other tasks as assigned. 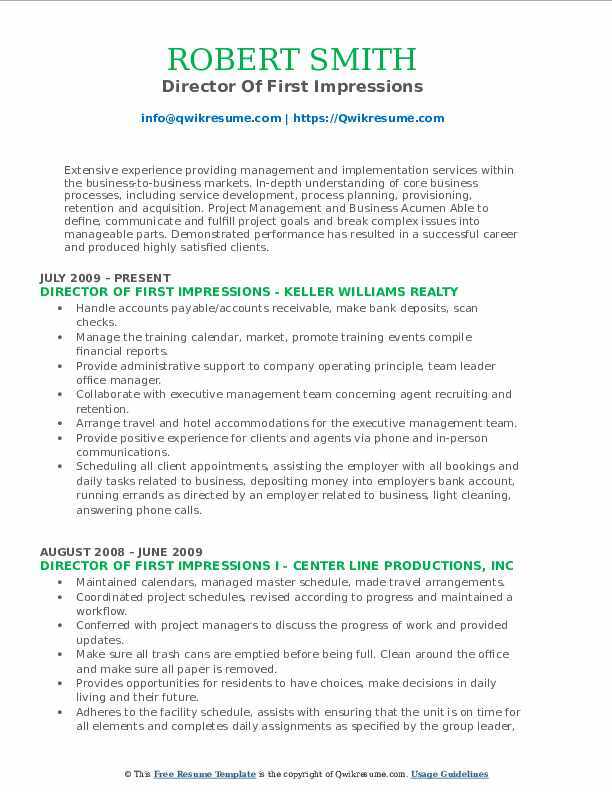 Knowledge, skills, and abilities to be highlighted in the Director of First Impressions Resume are – excellent communication skills, interpersonal skills, extraordinary client-service orientation, excellent attitude, telephone etiquette, professional demeanor and the proficiency to use all types of equipment including computer literacy. Qualified candidates normally portray a college degree. 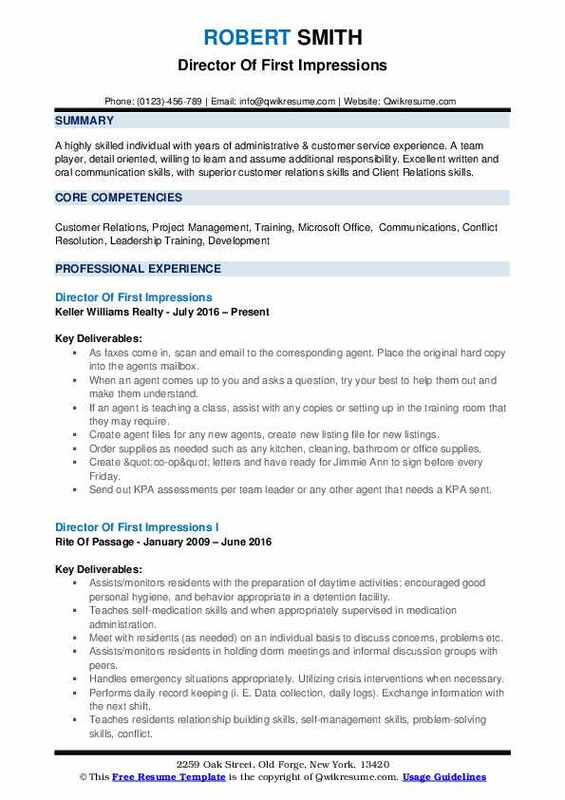 Summary : Highly motivated, experienced manager with more than 15 years in a client service/training capacity. Strong background in provider relations, benefits, product training, sales support and customer service. Key strengths include exceptional communication and interpersonal skills, strong organizational skills, ability to work in a fast-paced environment and flexibility. Using a multiline phone system, answer phones, direct calls, respond to inquiries. Greet visitors and agents, etc., and direct them or answer questions as required. Maintaining daily event board to include all classes, office events, birthdays and trivia (to make them read the board). Updated our internal manual as needed, the 100-day packet for agents, PPM doc. Order office supplies to include FedEx supplies monthly for the office and restock as required. Take care of all office maintenance including the water machine, two copiers, all lights, carpet cleaning, keys, etc. Manage all key FOBs for the office and order business cards and nametags for agents. Sort mail (set up and remove boxes as required), all UPS and FedEx arrivals. Sent out KPA reports to all incoming agents, employees as requested and sent results. 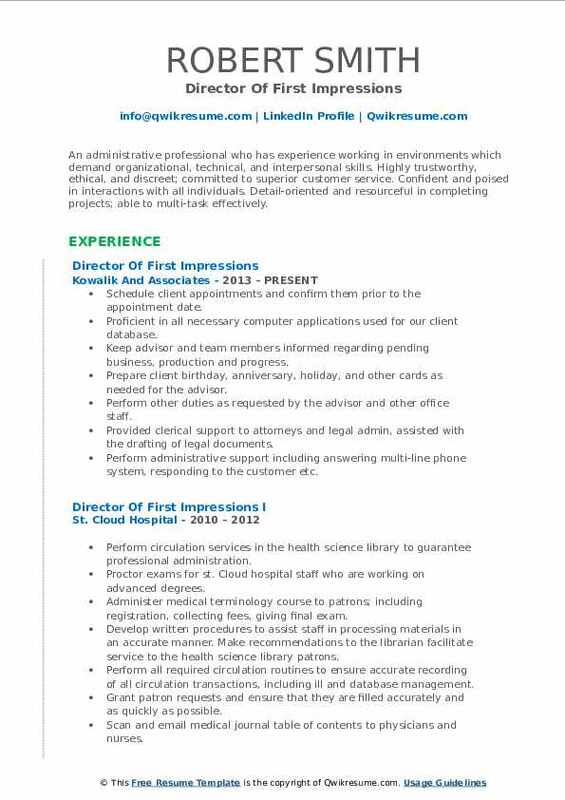 Summary : A highly skilled individual with years of administrative & customer service experience. A team player, detail oriented, willing to learn and assume additional responsibility. Excellent written and oral communication skills, with superior customer relations skills and Client Relations skills. As faxes come in, scan and email to the corresponding agent. Place the original hard copy into the agent's mailbox. When an agent comes up to you and asks a question, try your best to help them out and make them understand. If an agent is teaching a class, assist with any copies or setting up in the training room that they may require. Create agent files for any new agents, create new listing file for new listings. Order supplies as needed such as any kitchen, cleaning, bathroom or office supplies. Create "co-op" letters and have ready for Jimmie Ann to sign before every Friday. Send out KPA assessments per team leader or any other agent that needs a KPA sent. As agents leave or come into the office, make sure to add or remove from everything including; copy. Create a monthly calendar and send out to all agents. Print out hard copies for the front. Summary : A highly resourceful, flexible and enthusiastic individual who possesses a considerable amount of knowledge regarding administrative and office procedures. 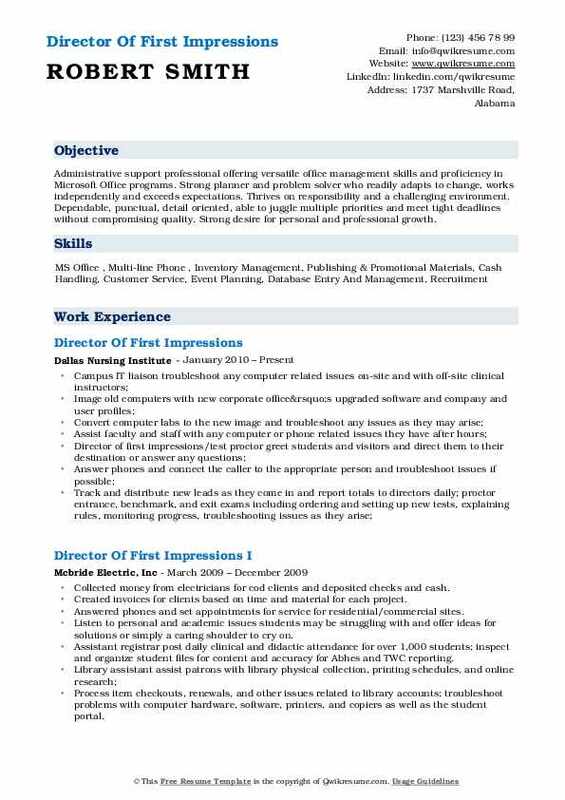 A quick learner who can absorb new software and is experienced in coordinating, planning and organizing a wide range of administrative activities. A team player with a proven ability to work proactively in a complex and busy environment. 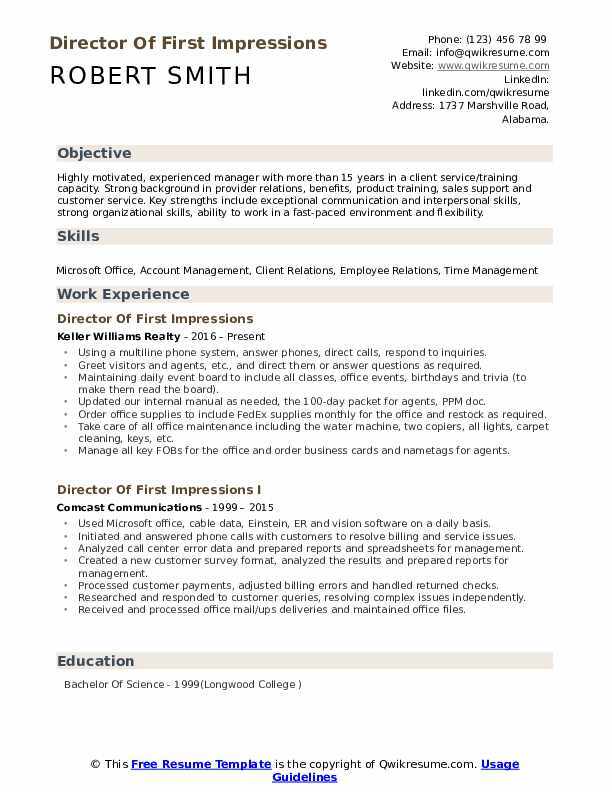 Skills : CampusVue and Microsoft Office, - Word, Excel, PowerPoint, Organizational Communication, Verbal And Written, Outgoing Personality, Self Organized, Independent And Team Worker With The Ability To Multi-Task and prioritize, Stress Tolerant. As the face of the company and the first point of contact, it is essential to practice excellent telephone etiquette and maintain a pleasant, friendly and helpful disposition when interacting with others in order to create a positive, caring and professional impression with prospective students, coworkers, and the public. 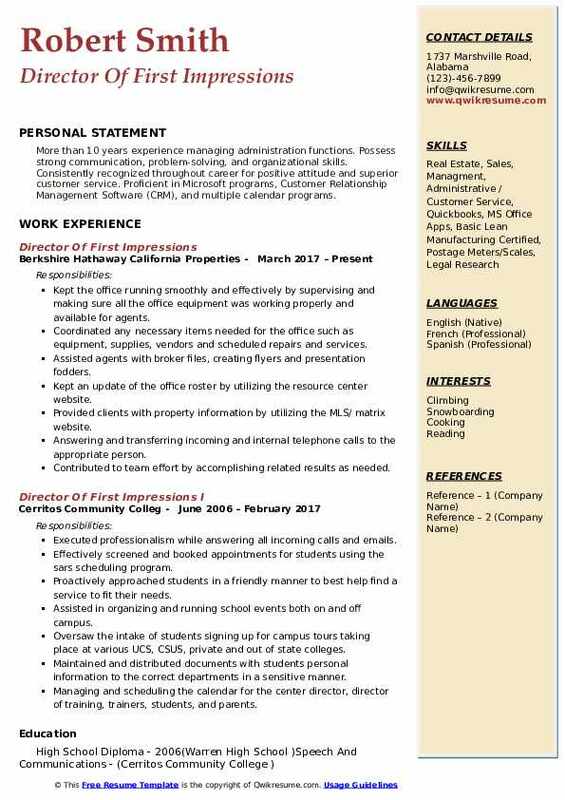 Assistant to campus executive, as well as other university staff members. Answers multiple phone lines, maintains/orders printing, postage and office supplies. Oversees office maintenance and repairs, and other various administrative assistant duties as assigned. Updates and prints class rosters - updates electronic student data, schedules appointments between students and academic advisors. Creates letters and generates reports in Campusvue, maintains all student files. Administers CLEP examinations, updates and maintains CLEP software, direct point of contact for CLEP support. Assures all student transcripts are properly requested, received and accurate before sending to registrars office for evaluation. Plays an important key role contributing to event planning such as: graduation, new student orientation, town-hall meetings; attends weekly staff meetings and records meeting minutes. Summary : An administrative professional who has experience working in environments which demand organizational, technical, and interpersonal skills. Highly trustworthy, ethical, and discreet; committed to superior customer service. Confident and poised in interactions with all individuals. Detail-oriented and resourceful in completing projects; able to multi-task effectively. Schedule client appointments and confirm them prior to the appointment date. Proficient in all necessary computer applications used for our client database. Keep advisor and team members informed regarding pending business, production and progress. Prepare client birthday, anniversary, holiday, and other cards as needed for the advisor. Perform other duties as requested by the advisor and other office staff. Provided clerical support to attorneys and legal admin, assisted with the drafting of legal documents. Perform administrative support including answering multi-line phone system, responding to the customer etc. Troubleshoot and schedule maintenance for copiers, computers and office equipment. Prepare meetings for guests, including providing reading material, snacks and refreshments. 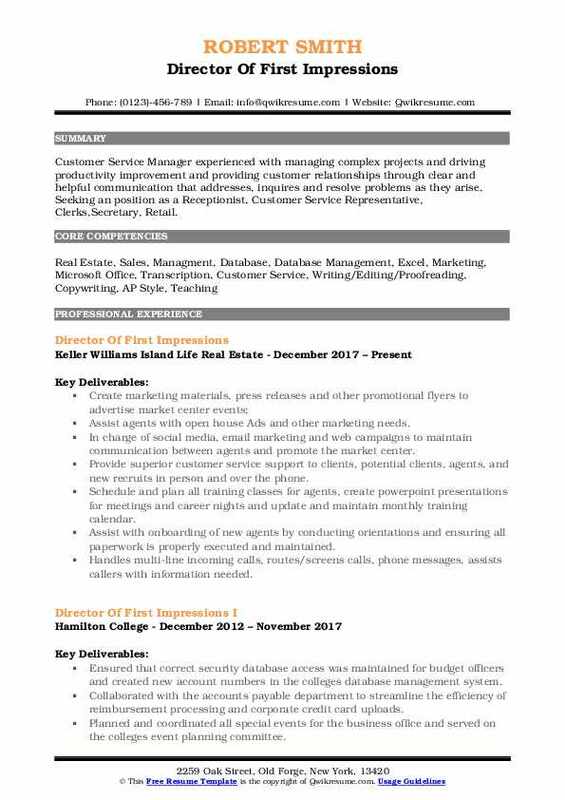 Objective : To obtain a position within a growing, evolving company where my knowledge can be utilized granting me the opportunity to grow with the company. Supporting an office of 65 agents, Front desk clerical and office management/marketing. Promoted to director of agent services when moved out of the county. Remotely from home and commuted once a week for in-person appointments and training. Became an expert in KW back office and marketing. Database, create marketing materials such as listing presentations and coordinated agent services events. Collaboratively work with a mortgage and title/escrow companies such as movement mortgage and orange coast title. Currently working as an independent contractor with the company on a part-time basis. Managed real estate listings and surveys for mortgage companies signage requirements. Met reconciliation deadlines for copier/printer counts for the billing department. Handling incoming telephone calls, scheduling showings for clients, sorting and distributing mail, sending periodic client correspondence. 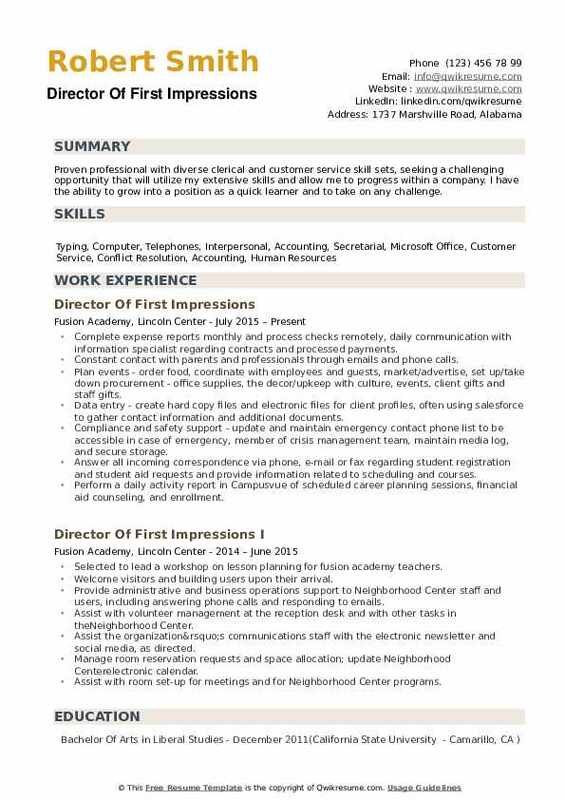 Summary : Administrative support professional offering versatile office management skills and proficiency in Microsoft Office programs. Strong planner and problem solver who readily adapts to change, works independently and exceeds expectations. Thrives on responsibility and a challenging environment. Dependable, punctual, detail oriented, able to juggle multiple priorities and meet tight deadlines without compromising quality. Strong desire for personal and professional growth. Assist admissions representatives with study guide sales, entrance exams results, and rescheduling tests. Summary : Extensive experience providing management and implementation services within the business-to-business markets. In-depth understanding of core business processes, including service development, process planning, provisioning, retention and acquisition. Project Management and Business Acumen Able to define, communicate and fulfill project goals and break complex issues into manageable parts. Demonstrated performance has resulted in a successful career and produced highly satisfied clients. Handle accounts payable/accounts receivable, make bank deposits, scan checks. Manage the training calendar, market, promote training events compile financial reports. Provide administrative support to company operating principle, team leader office manager. Collaborate with executive management team concerning agent recruiting and retention. Arrange travel and hotel accommodations for the executive management team. Provide positive experience for clients and agents via phone and in-person communications. Scheduling all client appointments, assisting the employer with all bookings and daily tasks related to business, depositing money into employers bank account, running errands as directed by an employer related to business, light cleaning, answering phone calls. Provide administrative support to staff and faculty on an as-needed basis. Demonstrated hospitality with an organized welcoming lobby and greeted guests warmly. Headline : Customer Service Manager experienced with managing complex projects and driving productivity improvement and providing customer relationships through clear and helpful communication that addresses, inquires and resolve problems as they arise. Seeking​ an position as a Receptionist, Customer Service Representative, Clerks,Secretary, Retail. Assist agents with open house Ads and other marketing needs. In charge of social media, email marketing and web campaigns to maintain communication between agents and promote the market center. Provide superior customer service support to clients, potential clients, agents, and new recruits in person and over the phone. Schedule and plan all training classes for agents, create powerpoint presentations for meetings and career nights and update and maintain monthly training calendar. Assist with onboarding of new agents by conducting orientations and ensuring all paperwork is properly executed and maintained. Handles multi-line incoming calls, routes/screens calls, phone messages, assists callers with information needed. Used multiple listing services (MLS) to apply insightful real estate information. Handled and processed all incoming phone inquiries using a multi-line telephone system. Summary : More than 10 years experience managing administration functions. Possess strong communication, problem-solving, and organizational skills. Consistently recognized throughout career for positive attitude and superior customer service. Proficient in Microsoft programs, Customer Relationship Management Software (CRM), and multiple calendar programs. Kept the office running smoothly and effectively by supervising and making sure all the office equipment was working properly and available for agents. Coordinated any necessary items needed for the office such as equipment, supplies, vendors and scheduled repairs and services. Assisted agents with broker files, creating flyers and presentation fodders. Kept an update of the office roster by utilizing the resource center website. Provided clients with property information by utilizing the MLS/ matrix website. Answering and transferring incoming and internal telephone calls to the appropriate person. Provided realtors with support in regards to running background checks, marketing, and any other queries. Responsible for triage of incoming information including leads and payments to the relevant realtors and support staff. 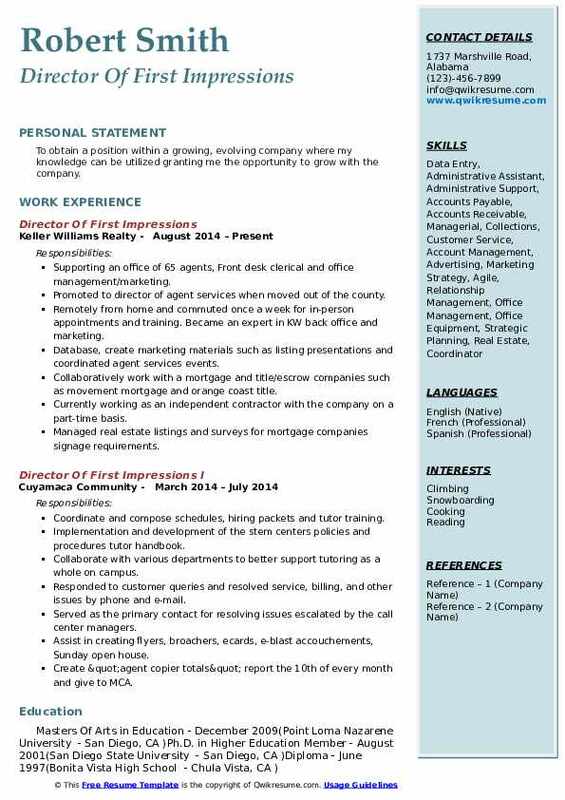 Objective : Proven professional with diverse clerical and customer service skill sets, seeking a challenging opportunity that will utilize my extensive skills and allow me to progress within a company. I have the ability to grow into a position as a quick learner and to take on any challenge. Complete expense reports monthly and process checks remotely, daily communication with information specialist regarding contracts and processed payments. Constant contact with parents and professionals through emails and phone calls. Plan events - order food, coordinate with employees and guests, market/advertise, set up/take down procurement - office supplies, the decor/upkeep with culture, events, client gifts and staff gifts. Data entry - create hard copy files and electronic files for client profiles, often using salesforce to gather contact information and additional documents. Compliance and safety support - update and maintain emergency contact phone list to be accessible in case of emergency, member of crisis management team, maintain media log, and secure storage. Answer all incoming correspondence via phone, e-mail or fax regarding student registration and student aid requests and provide information related to scheduling and courses. Perform a daily activity report in Campusvue of scheduled career planning sessions, financial aid counseling, and enrollment. Receive and distribute all internet inquiries using the guidelines established by the campus director of admissions to include, immediately announcing the receipt of the inquiry by intercom telephone to the admission representative up for rotation. Greets, assists and directs guests, colleagues, visitors, vendors, students, contractors and the general public.